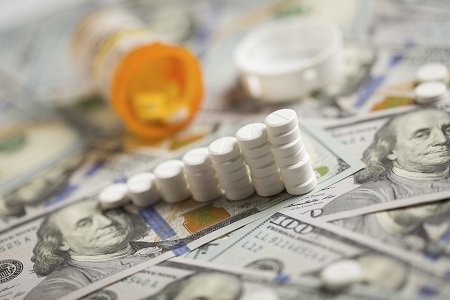 The pharmaceutical industry has been restructuring its research and development units due to constant pressure from patent expiry, generic competition, and declining revenues in order to achieve cost-cutting. This has resulted in increased outsourcing leading to growth in strategic partnerships from 12 to 15 percent in 2014 to greater than 30 percent in the next two years. Contract Research Organizations (CROs) are responding to these market dynamics to enhance their service offerings either through expansion or mergers & acquisitions. This is driving consolidation in the market as a result of high competition between the CROs to obtain market share. To highlight this trend, we have attempted to rank the CROs based on their clinical revenue, as this is their core source of revenue. The Global CRO market in 2014 reached approximately $27 billion and is expected to grow at a CAGR of 6.6 percent to reach $32.7 billion by 2017.1 This is due to increased outsourcing with an adoption rate of greater than 50 percent seen within the pharmaceutical and biotechnology industry. More than 78 percent of the global CRO market revenue comes from the clinical CRO market. The clinical CRO market reached $21.2 billion in 2014 and is expected to grow at a CAGR of 6.4 percent to reach $25.5 billion by 2017.1 This market growth is directly related to around 50 percent of Phase 2 through 4 activities already being outsourced by pharma companies. 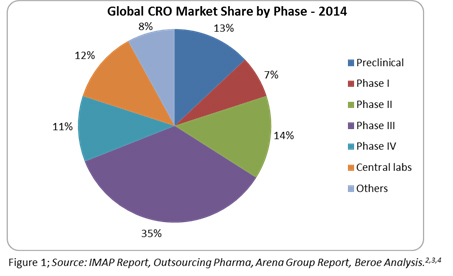 Figure 1 below shows the percentage of CRO market share by trial phase. As the cost of conducting clinical trials in emerging countries is around 40 to 60 percent less than that of developed countries, the CRO market in emerging countries is growing in double digits with growth mainly driven by China which holds approximately 7 to 10 percent of the global share.17,18 USA and Europe hold 43 and 40 percent of the CRO market, growing only in single digits. CROs have evolved from being a provider of non-core services to being an integral part of the drug discovery and development process.9 Several acquisitions were seen during the last three years with an attempt to expand the service offerings and enter into strategic partnerships with large pharma & biotech companies. Consolidation in this space is on the rise, and as the industry matures, further mergers & acquisitions of smaller players are anticipated. This has in turn resulted in greater than 50 percent of the market being held by bigger companies, leaving the smaller ones to either survive by specializing in niche areas or by getting acquired. Specialization in terms of adaptive trial design is seeing greater traction with a current adoption rate of greater than 20 percent, with CROs forming partnerships with adaptive trial design software providers. PPD’s collaboration with Berry consultants and Icon’s acquisition of Aptiv Solutions is an example of this trend. 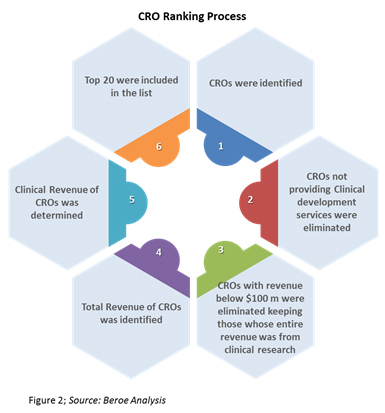 CRO rankings are based on their revenue generated from the clinical research segment. This revenue includes services such as Phase 1 through 4 clinical research, central laboratories, and associated biometric services with the exclusion of discovery, preclinical services, and consulting business segment revenues. The clinical revenues of CROs were obtained from their annual reports, and estimations where made based on company size, projected market share, and service line where revenues were unavailable (Figure 2). Table 1 below shows the top 10 clinical CROs based on the above ranking process. 2012 rankings published by Scrip intelligence included 17 CROs in their research.6 In comparison with our CRO ranking, some positions were shuffled in 2014 as presented in Table 2 below. The entry of midsize CROs in the top 20 league indicates the growth of the CRO industry and also supports the fact that, to remain competitive, CROs need to differentiate — either through niche area specialization, technological expertise, or through geographic expansion. Though the top 20 positions are not held by regional CROs, these players are efficient enough to conduct regional studies. 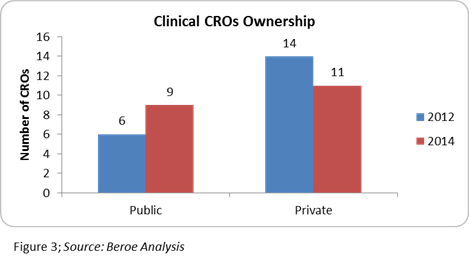 Further analysis of the CROs ownership status revealed that several of them went public, indicating healthy industry growth (Figure 3). The industry is expecting more companies to go public — an example of this being the recent news that Medpace is planning an IPO.16 This is a good indication for mid-size CROs, as this sets an example of how they can thrive in the market with their niche capabilities. The Clinical CRO market is dominated by large global players such as Covance, Icon, Parexel, PPD, and Quintiles. By utilizing the newest technology and approaches in the industry, such as adaptive trials, evidence-based trial designs, eClinical solutions, and others, these big CROs are trying to showcase themselves as a one-stop-shop, and, hence, winning over strategic partnerships on volume commitments. This trend will continue as further mergers and acquisitions take place, driving consolidation of the supply base. Sapna is a Senior Research Analyst with the clinical team of Beroe Inc. She handles the Clinical Development category and specializes in understanding the market scenario, supplier landscape, and innovations within Pharma R&D. She has completed her masters in Pharmacoinformatics from National Institute of Pharmaceutical Education and Research (NIPER) India, where she was actively involved in Insilco research tools and methods.